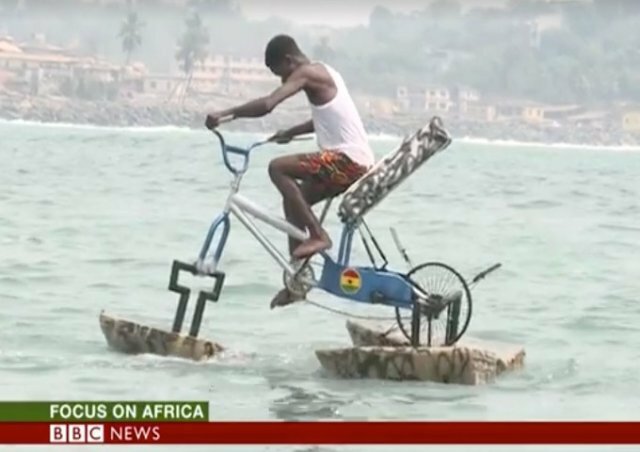 Unless you have not been following the news, you must have heard about the young inventor, Frank Darko who recently tested his invention, the Floating Bicycle on the open sea in his hometown, Takoradi in Ghana. Frank Darko is a young Graphic Design student of the Takoradi Technical University who hails from Takoradi. He would have been in his final year had he not deferred his course for personal reasons. 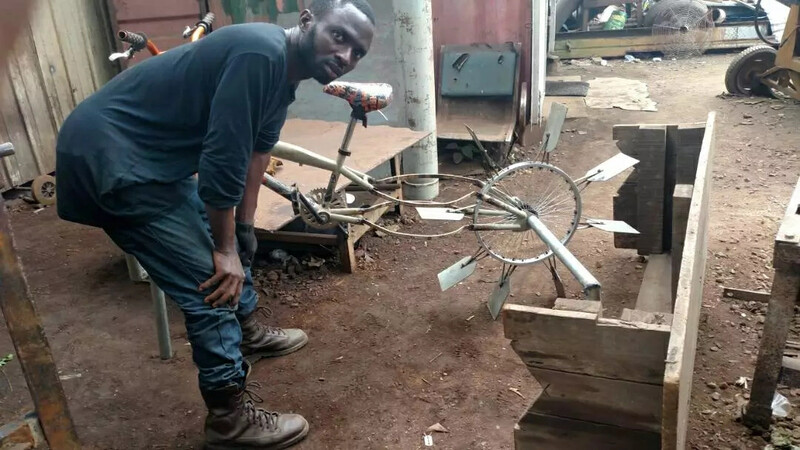 The remarkable young man has pursued his passion in science and technology and invented the Floating Bicycle. After witnessing the devastating effects of flooding in his hometown, especially how school children become stranded and cannot cross the rivers through conventional boats to get to school, he decided to help find a solution that would enable the children go to school no matter the weather condition. This is how the floating bicycle was conceived. It consists of a the basic structure of a bicycle fitted with a rotating motor. 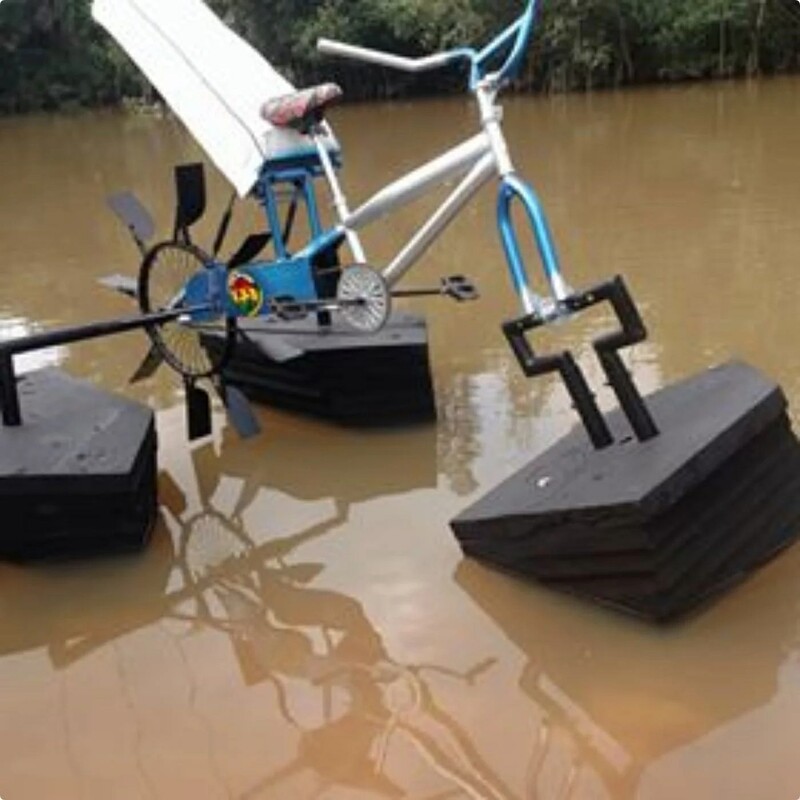 The wheels of this floating bicycle has been replaced with floating wood, the type used for boats. All these spare parts are easily accessible in Ghana and other third world countries. This makes his invention practical and sustainable. Currently, Frank Darko is looking for investors and supporters to help him scale up and produce his invention in a large scale. Such an endeavour is worth celebrating and commending. We hope to see more of Frank and his wonderful invention.